It’s not a good sign when you begin to play a Children of Bodom album with trepidation, if not downright fear — fear that it would be as largely forgettable as Blooddrunk, fear that one of your personal gateways to the realms of extreme metal would begin to tumble further down the barren road toward formulaic pandering, fear that a band which used to have some real teeth to go along with all the flashy fretwork and power-metal keyboard riffing would begin to gum their food. That was me — fearful. I am happy to say that, at least for now, those fears have subsided. 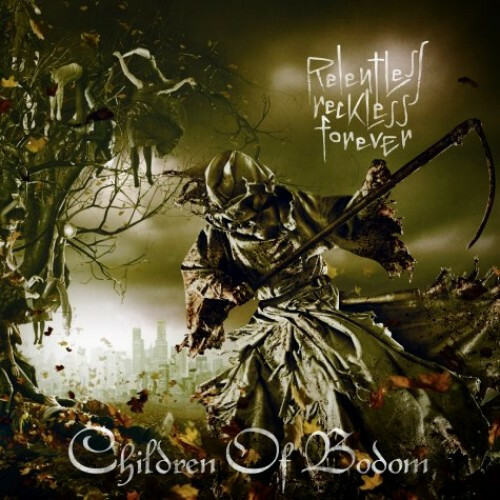 The new COB disc, Relentless, Reckless Forever, is not as relentless or as reckless as I might have wished, but it’s a step up from the last album. The band genuinely bear their fangs and flex some claws more than they have in recent memory, the borderline-cheesy, pop-metal stylings have been dialed back, and on some songs the band take a few welcome steps outside their comfort zone. 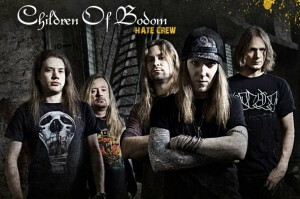 Having said that, not all is completely well in the Land of Bodom. For me, the question posed by the first single, “Was It Worth It?”, is “not really” (despite the presence of an infectious chorus riff). The closer, “Northpole Throwdown”, is a song destined to be forgotten — an uninspired thrash-and-keyboard sandwich that just isn’t spicy enough. And then there’s a number called “Pussyfoot Miss Suicide”. It’s not nearly as embarrassing as the song title (how could it be?). In fact, it’s a heavy song musically, but I made the mistake of reading the lyrics. Embarrasing. The album opener, “Not My Funeral”, will get you moving in a damned hurry. It’s mainly fast, thrashy, and frenetic (like most of the album), but the dynamic rhythms don’t get stuck exclusively in the fast lane, and Alexi Laiho’s solo is refreshingly restrained. It goes on my playlist. So does “Shovel Knockout”, the next track. It’s got a cool bass riff in the intro, layered guitar mayhem galore, and another especially good, non-self-indulgent solo. Alexi’s vocals also sound believably insane. Those first two songs were early signs that I could lock away my fears for the time being. But they aren’t the only strong offerings on the album. 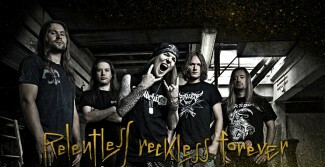 “Ugly” has got a nice, zombified lurch and stagger in the mix, plus a riveting Laiho solo. “Cry of the Nihilist” stomps and jumps while it snaps your neck, and Alexi’s vocals sound positively evil. With the exception of the borderline cheesy gang-shouts, I also liked the one mid-tempo song on the album, “Roundtrip To Hell and Back”. But the title track is the leading candidate for my favorite. It’s flush with convulsive beats and includes a groaning rhythm guitar riff — yes, a groaning riff on a COB song — in addition to a thundering, shuddering bass line. Refreshingly, the keyboards also seem to be sitting this one out. The song is potent, made all the more so by one of Alexi’s best double-tracked guitar solos on the record, and it’s catchy as an influenza epidemic. This one definitely goes on the COB playlist. Sometimes I fall into a way of thinking — that Alexi Laiho can write and play highwire riff-and-solo extravaganzas in his sleep. They come so often in the music that I find myself starting to take them for granted, and on COB’s weakest recent songs, they seem to have become a crutch that he may think (falsely) will make up for other deficits in the songwriting. However, there’s no denying that he’s a cometary talent, and this album shows that the rest of COB’s members are excellent musicians, too. Despite how much I still enjoy COB’s signature sound, what I also still wish for is a surprise — a sprinkling of more songs that move the band out of its comfort zone, songs like “Not My Funeral” and this album’s title track, except even more so. Songs that raise the hackles on your neck or swamp you in darkness — more of the beast and less of the party animal. Maybe that’s just me. Yet, when all is said and done, this album’s strengths outweigh its weaknesses, and I’m pretty happy with it. Yeah I liked it. i thought it had a slight sense of rock to it, more like hard rock I should say. But it was thrashy and I was tapping my foot, so that’s a good sign! If your a male or lesbian COB fan you might want to check out the link below. I listened to this album expecting absolutely nothing, yet I got a little something, I at least didn’t finish thinking it was utter shite and it will never grace my ears again. Certainly a step up from Blooddrunk and I can’t argue with the review, pretty much spot on. Islander, what IS your CoB playlist!?!?! that would be a cool article–or series of articles. That playlist is almost exactly identical to mine…..amazing. Cool! I was expecting comments along the lines of, “You moron, what is XYZ doing on your list instead of ABC?” But the day is young . . .